"You're pushing sixty," she said, "maybe it's your eyes." There was an abandoned school bus way down in a hardwood bottom. Who put it there, how, when and why, remain unknown. But unknown years later, persons also unknown tipped it on its side using means unknown and robbed the transmission. It had been there so long, the deer thought it was geography. Soft maple and sweet gum sprouted and prospered, but with some judicious pruning and a folding chair, that old bus made a wonderful stand. I took half a dozen passable bucks from the perch. He was a fat eight-pointer with tall tines and full of himself in rut. He was eying a doe at the far end of the clearing, turning his head this way and that so his antlers caught the very last of the afternoon light. "Dead deer," I said. I was shooting a Swedish Mauser in those days. Six-point-five, like a .243 on steroids, topped with a forty-year-old Weaver fixed power, a K-4, if memory serves. I put the crosshairs on him, thin as spider web silk. And then I suffered what is genteelly known in these parts as "a failure to fall." The buck bolted behind a knot of scrub pines. I stood and chambered another round. He may not have seen me, but he didn't need to. The clack-clack of the Mauser's lock-up and the ping of the empty on the bus told him exactly where I was. But there was no direction he could go and not get shot, or at least shot at. "Come on, come on, come on!" I shook and sweated and waited. I saw my pulse at the edges of my eyes. Nothing. When it was all over, I investigated by flashlight. There was a deadfall pine log, fourteen, fifteen inches thick. Behind the log the leaves were peeled all bottom side up. That buck had scooted to safety, crawling on his belly. If you've never seen it, take my word: A buck can crawl as fast as he can run. "Don't worry honey," she said. "I heard the shot. It was pretty close to dark." "Gettin' along about can't see," I agreed. I was heavy into whiskey and remorse. Christmas, there was a Leupold VX-III under the tree, 4.5-14x. It was a four-hundred-yard scope, where I typically shot at forty. But as with all extravagant gifts, I was obligated to use it. It was so massive I had to buy new mounts and rings. Yes, you could count the hairs on a wild boar's snout at midnight, but even on the lowest power, you'd see black if you didn't look just right. At higher powers it was absolutely unmanageable when anything happened quick. While I might have been "under-scoped" with the old Weaver, I was surely "over-scoped" now. There's magnification, eye relief, brightness, diameters of tube, ocular and objective lenses. There is field-of-view, focus and the voodoo of parallax. There are dozens of crosshairs, unlighted or lit with adjustable intensity powered by hearing aid batteries. 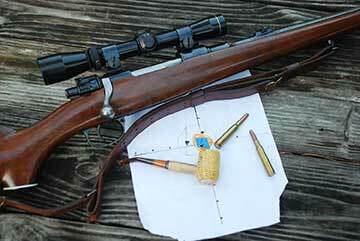 There are scopes specific to caliber and load, denoting expected points of impact from one to three hundred yards. And if that were not enough to make a deacon come out the church, in most of the above combinations and permutations, you can have your pick of finishes, matte or gloss blue, bright or brushed stainless, sometimes even rubber armored, brown, green or camo. Confused yet? Good. I am a leading regional expert in being confused by scopes, with more than forty years of experience. But I have finally learned a few things, which I will happily share here, free and worth every dime. Number one: There are no free rides in the universe, unless you are off among the planets, sailing on the solar wind. Increase brightness and you will almost certainly increase cost. But as investments go, it's way better than most. Buy the best quality glass you can afford. Number two: Beware electronics. The light from an illuminated reticle, no matter how faint, shining straight into your eyeball and brain, will compromise your vision in low light. And every button, every switch and every knob is an avenue for potential failure. No real problem down in the Edisto Swamp with a four-and-a-half-month season, but a scope rolling over when you're on a five-and-a-half-day mulie hunt in the Missouri Breaks would be a major disappointment and somewhat worse if you were facing down a critter intent on revenge. Number three: More is not necessarily better when it comes to magnification. Variable scopes in the 3-9x range are by far the most commonly seen, probably because they are most commonly available, but the vast majority of South Carolina deer hunters will never need 9x magnification. Increase magnification and you narrow your field of view, making the position of your eye, and even the hunch of your shoulder, doubly important to accuracy. 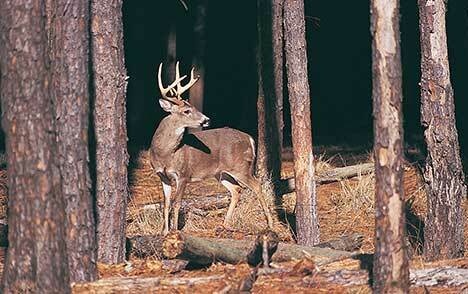 A 2-7x would be a better choice for most Palmetto State whitetail hunting. Dialed down to 2x, it's perfect for Lowcountry thickets, where things tend to be close and quick. Cranked up to 7x, it will reach at reasonable range across a Midlands or Pee Dee bean field if you do your part. And you can twist it back down in the timbered Appalachian sidehills. My all-time favorite is the Leupold VX-II 2-7x, a mainstay of American-owned Leupold and Stevens for fifty years - plenty of time to work out the bugs. If you simply must have a 3-9x, the Conquest from Carl Zeiss is one of my favorites. They are very bright, with wonderful heavy European style crosshairs you will never lose in a jumble of brush. Ah, but I dream of Africa, of going back and walking the rotten stone slopes of the blue Nchindi Hills, where the Luangwa flows to the Great Zambezi while the last of the brushfires smolder and the country thereabouts smells like burnt oatmeal. Shadrick, my old gunbearer and dear friend, will somehow be at my side again, and he will carry my weapon, chambered in .375 H&H. I will be unarmed but I will not fret. Shad will be six inches off my right elbow, quick of hand and sharp of eye, ready with a good rifle topped with the best glass. I do not know the rifle just yet but I know the glass. A Swarovski Z6, and I will carry it at the lowest magnification. It is bright and clear and indestructible, with an astounding hundred-foot-wide view at one hundred yards and a manufacturer's suggested retail approaching $2,000. Two grand for a scope? Well, I can dream, can't I? And if I never get back to Africa, maybe I can put it to use along the banks of the South Santee, where the boars are the color of cast iron and come huffing towards you like steam locomotives. I'll have only seconds to stop him, and you can't shoot what you can't see. Roger Pinckney is a novelist and freelance writer living on Daufuskie Island.